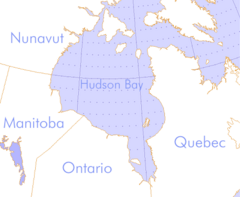 Hudson Bay (French: baie d'Hudson) is an immense inland sea that penetrates deeply into northeastern Canada. This relatively shallow body of water is bounded by Manitoba and Ontario to the south, and Quebec to the east. Nunavut's mainland lies to the west. Southampton Island and Baffin Island semi-enclose the Bay on its north. The Hudson Strait exits the Bay on the northeast, connecting to the Labrador Sea and ultimately the Atlantic Ocean. It is connected with the Arctic Ocean to the north by the Foxe Channel and the Fury and Hecla Strait. A smaller offshoot of the bay, James Bay, lies to the south. Hudson Bay's drainage basin includes parts of five Canadian provinces (Alberta, Saskatchewan, Manitoba, Ontario, and Quebec), two Canadian territories (Northwest Territories and Nunavut), and small portions of four U.S. states (Montana, South Dakota, North Dakota, and Minnesota). The Bay is named for Henry Hudson who explored and mapped the area in 1610 and 1611 while seeking a Northwest Passage to Asia. While his discovery of a route to the continent's interior proved of inestimable value to England, Hudson's crew mutinied, setting him, his son, and seven loyal crewmen adrift in a small open boat with no provisions. In 1670, the Hudson's Bay Company was granted a charter by King Charles II, giving it a trading monopoly over the watershed of all rivers and streams flowing into Hudson Bay, thereby making the HBC owners of the whole of Rupert's Land. This covered an area of 1,500,000 square kilometers (580,000 sq mi), over one-third the area of Canada today. The bay played a crucial role in the early development of Canada after it was realized that it provided a direct route to the fur resources of the northwest. The Cree played an important role as middlemen between trappers and traders. Today the Cree, along with the Inuit, make up the sparse population of the bay's islands and shores. 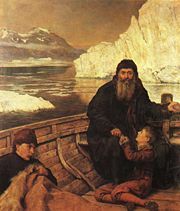 John Collier's painting of Henry Hudson with his son and some crew members after a mutiny on his icebound ship. 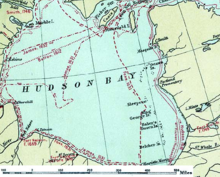 Hudson Bay was named after Henry Hudson, who explored the bay in 1610 on his ship, the Discovery. On this fourth voyage, Hudson charted a northerly course, reaching Iceland on May 11 and the south of Greenland on June 4. He worked his way around the west coast of Greenland and into the bay, mapping much of its eastern coast. At that point, the crew began to think that the ship had finally found a Northwest Passage through the continent. On June 25, the explorers reached the Hudson Strait at the northern tip of Labrador. Following the southern coast of the strait on August 2, 1610. the ship entered Hudson Bay. Hudson spent the following months mapping and exploring the eastern shores. In November the ship became trapped in the frozen waters of James Bay, forcing the crew to move ashore for the winter. Rupert's Land, a territory in British North America, consisting of the Hudson Bay drainage basin, that was owned by the Hudson's Bay Company for 200 years from 1670 to 1870. When the ice cleared in the spring of 1611, Hudson planned to continue exploring. His crew was disenchanted by that point, however, and wanted to return home. Believing that Hudson had pushed them too far, the crew mutinied on June 22, 1611, setting Hudson, his teenage son John, and seven crewmen loyal to Hudson adrift in a small open boat with no provisions. No one to this day knows the fate of Hudson and his loyal crew, although some claim that he successfully made his way as far south as the Ottawa River. Sixty years later the Nonsuch reached the bay and successfully traded for beaver pelts with the Cree. This led to the creation of the Hudson's Bay Company. The British crown awarded a trading monopoly on the Hudson Bay watershed, called Rupert's Land, to the Hudson's Bay Company. France contested this grant by sending several military expeditions to the region, but abandoned its claim in the Treaty of Utrecht (April, 1713). During this period, the Hudson's Bay Company built several forts and trading posts along the coast at the mouth of the major rivers (such as Fort Severn, Ontario, York Factory, Manitoba, and Churchill, Manitoba). The strategic locations allowed inland exploration and more importantly, facilitated trade with the indigenous people, who would bring fur to the posts from where the HBC would transport it directly to Europe. The HBC continued to use these posts until the beginning of the twentieth century. This land was ceded in 1870 to Canada as part of the Northwest Territories when the trade monopoly was abolished. In the nineteenth century European and U.S. whaling ships regularly prowled the waters off Southampton Island in the search for bowhead whales. In 1903, a gastrointestinal infection transmitted by workers at a Scottish whaling station on the island decimated nearly an entire village of Sallirmiut, an early indigenous group. Only one woman and four children survived to be taken in by local Inuit families. The area's whaling industry collapsed by the 1920s. Beginning in 1913, the Bay was extensively charted by the Canadian Government's CSS Acadia to develop for navigation. This resulted in the establishment of Churchill, Manitoba, as a deep-sea port for wheat exports in 1929 after unsuccessful attempts at Port Nelson. Due to a change in naming conventions, Hudson's Bay is now correctly called Hudson Bay. As a result, both the body of water and the company are often misnamed. In late spring (May), large chunks of ice float near the eastern shore of the bay, while to the west, the center of the bay remains frozen. Between 1971 and 2007, the length of the ice-free season in the southwestern part of the Hudson Bay—historically the last area to thaw—increased by about seven days. Hudson Bay rivers includes the principal rivers draining into the Hudson, James and Ungava bays of the Arctic Ocean. The total surface area of the Hudson Bay watershed is about 3,9 million km³ with a mean discharge of about 30,900 m³/s. The drainage basin includes parts of five Canadian provinces (Alberta, Saskatchewan, Manitoba, Ontario and Quebec), two Canadian territories (Northwest Territories and Nunavut) and small portions of four American states (Montana, South Dakota, North Dakota and Minnesota). The two principal waterways are the La Grande Rivière, in Québec, and the Nelson River in Manitoba, each with an average waterflow of over 3,000 m³/s. 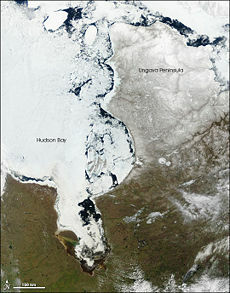 Hudson Bay was the growth center for the main ice sheet that covered northern North America during the last Ice Age. The whole region has very low year round average temperatures. The average annual temperature for Churchill at a latitude of 59°N was −5 °C (23.0 °F) during the period 1995–2007. Water temperature peaks at 8°-9°C (46°48°F) on the western side of the bay in late summer. It is largely frozen over from mid-December to mid-June when it usually clears from its eastern end westward and southward. A steady increase in regional temperatures over the last 100 years has been reflected in a lengthening of the ice-free period which was as short as four months in the late seventeenth century. The great quantities of nutrient salts in the bay provide food for mollusks, starfish, sea urchins, worms and other invertebrates. Species of fish include cod, halibut, salmon and polar plaice. The northern regions are home to walrus, dolphins, and beluga and killer whales. Polar bears migrate south to hunt seals among the ice. Caribou are common, as are some 200 species of birds including ducks, snow geese, gulls, swans, sandpipers, owls and crows, who gather on the coasts and islands of the bay. Hudson Bay has a salinity that is lower than the world ocean on average. This is caused mainly by the low rate of evaporation (the bay is ice-covered for much of the year), the large volume of terrestrial runoff entering the bay (about 700 km³ annually; the Hudson Bay watershed covers much of Canada, with many rivers and streams discharging into the bay), and the limited connection with the larger Atlantic Ocean. The annual freeze-up and thaw of sea ice significantly alters the salinity of the surface layer, representing roughly three years' worth of river inflow. The western shores of the bay are a lowland known as the "Hudson Bay Lowlands" which covers 324,000 square kilometers (125,000 sq mi). The area is drained by a large number of rivers and has formed a characteristic vegetation known as muskeg. Much of the landform has been shaped by the actions of glaciers and the shrinkage of the bay over long periods of time. Signs of numerous former beachfronts can be seen far inland from the current shore. 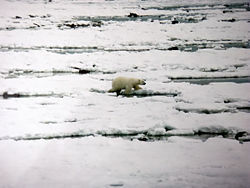 A large portion of the lowlands in the province of Ontario is part of the Polar Bear Provincial Park, and a similar portion of the lowlands in Manitoba is contained in Wapusk National Park, the latter location being a significant Polar Bear maternity denning area. In contrast, most of the eastern shores form the western edge of the Canadian Shield in Quebec. The area is rocky and hilly. Its vegetation is typically boreal forest, and to the north, tundra. Measured by shoreline, Hudson Bay is the largest bay in the world, while the largest in surfce area the Bay of Bengal at 2,172,000 km². The Common Eider breeds on the bay's islands. Adult male left, female right. There are numerous islands in Hudson Bay, mainly near the eastern coast. All are part of the territory of Nunavut. One group is known as the Belcher Islands, an archipelago of approximately 1,500 islands and islets covering a total area of about 13,000 square kilometers (5,000 sq mi), of which 2,896 square kilometers (1,118 sq mi)is land. First sighted by Henry Hudson, he named them for Sir Edward Belcher, who commanded an Arctic expedition in search of Sir John Franklin. The archipelago was explored and mapped in 1915. Large deposits of iron ore underlie the Belcher and neighboring Nastapoka islands. Another group is the Ottawa Islands, a group of 24 small uninhabited islands located a short distance off the northwest coast of Quebec's Ungava Peninsula. Like the Belcher Islands, they are a breeding ground for the Hudson Bay subspecies of the Common Eider. When Earth's gravitational field was mapped beginning in the 1960s, a large region of below-average gravity was detected in the Hudson Bay region. This was initially thought to be a result of the crust still being depressed from the weight of the Laurentide ice sheet during the most recent Ice Age, but more detailed observations taken by the GRACE satellite suggest that this effect cannot account for the entirety of the gravitational anomaly. It is thought that convection in the underlying mantle may be contributing. The Nastapoka arc is a geological feature located on the southeastern shore of Hudson Bay. It is a near-perfectly circular arc, covering more than 160° of a 450 km diameter circle with the Belcher Islands forming the central uplift area. Due to its shape, the arc has long been suspected as the remnant of an ancient impact crater, but no evidence has been found that conclusively supports or discounts this theory. Another common explanation for the arc's origin is glacial loading during an ice age. The coast of Hudson Bay is sparsely populated with only about a dozen villages. Some of these were founded in the seventeenth and eighteenth centuries by the Hudson's Bay Company as trading posts, making them part of the oldest settlements in Canada. With the closure of the HBC posts and stores in the second half of the 20th century, many coastal villages are now almost exclusively populated by Cree and Inuit people. Some of the more prominent communities along the Hudson Bay coast include Puvirnituq Quebec; Churchill, Manitoba; and Arviat and Rankin Inlet - both in Nunavut. Not until the Cold War was there any military significance attributed to the region. In the 1950s, a few sites along the coast became part of the Mid-Canada Line, a line of radar stations across the "middle" of Canada to provide early warning of a Soviet bomber attack on North America. The majority of Mid-Canada Line stations were used only briefly from the late 1950s to the mid-1960s. The Arctic Bridge shipping route is hoped to link North America to markets in Europe and Asia using ice-free routes across the Arctic Ocean. 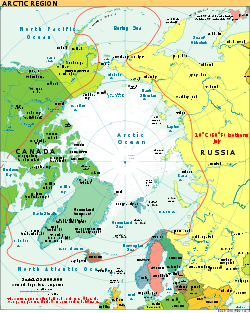 The Arctic Bridge or Arctic Sea Bridge is a potential sea route linking Russia to Canada, specifically the Russian port of Murmansk to the Hudson Bay port of Churchill, Manitoba. It is not an actual bridge, but a shipping route which would effect the nations with lands near the Arctic Circle. The concept has long been a priority for the government of Manitoba, which sees vast potential as the northern hub of a mid-continent trade corridor that would extend to the Gulf of Mexico. Many view the creation of such a route as a crucial link between Eurasia and North America with the potential to change the face of business. The only Arctic deep water port in Canada is located at Churchill, Manitoba. It is the principal seaport on Canada's northern coast and has rail and air (but no road) connections to the rest of the nation. It is the northern terminus of the Hudson Bay Railway and is a useful link in the export of grain from the Canadian Prairies to European markets. Research has indicated that Churchill offers the most cost-effective and time-efficient route for transportation of goods between central North America and Northern Europe. On February 15, 2002, Manitoba Premier Gary Doer signed a letter of intent to move toward development of the arctic bridge. Doer was joined at the signing ceremony by Vladimir Motlokhov, vice-governor of Murmansk, and Vladimir Yevseyev, committee chair for foreign economic relations, Murmansk. Russia has shown a keen interest in developing such a shipping route. According to the Russian Federation's Ottawa press attaché, Sergey Khuduiakov, the opening of the trade route has been enabled by the retreat of Arctic ice, due to global warming, though other experts believe the ice retreat is a temporary phenomena. On October 17, 2007 the Kapitan Sviridov docked in Churchill having sailed from Estonia loaded with bags of fertilizer destined for sale to North American farmers. It was the first time the port accepted imports from Russia and was hailed as an historic step in the construction of the Arctic bridge. Officials from the Russian embassy along with representatives of the port of Churchill, the Murmansk Shipping Company and the government of Manitoba greeted the ship. ↑ Helmut E. Landsberg, World Survey of Climatology (Amsterdam: Elsevier, 1980, OCLC 59248719). ↑ C. Michael Hogan, November 18, 2008, Polar Bear, Ursus maritimus, GlobalTwitcher.com. Retrieved January 10, 2009. ↑ New Scientist, Satellites solve mystery of low gravity over Canada. Retrieved May 11, 2007. ↑ Carlyle Smith Beals, Ian Halliday, and John Tuzo Wilson, Theories of the Origin of Hudson Bay: 1.: On the Possibility of a Catastrophic Origin for the Great Arc of Eastern Hudson Bay (Ottawa: Dominion Observatory, OCLC 251468165). ↑ Manitoba Government, February 15, 2002, Premier signs letter of intent to further develop Arctic Bridge. Retrieved January 10, 2009. ↑ 6.0 6.1 Joe Friesen, October 18, 2007, Russian ship crosses 'Arctic bridge' to Manitoba, Globe and Mail. Retrieved January 10, 2009. Beals, Carlyle Smith, Ian Halliday, and John Tuzo Wilson. 1968. 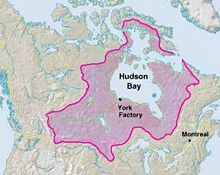 Theories of the Origin of Hudson Bay: 1.: On the Possibility of a Catastrophic Origin for the Great arc of Eastern Hudson Bay. Contributions from the Dominion Observatory, Ottawa, 4,29. Ottawa: Dominion Observatory. OCLC 251468165. Meinig, D. W. 1986. The Shaping of America: A Geographical Perspective on 500 Years of History. New Haven: Yale University Press. ISBN 9780300104325. Natural Resources Canada. Atlas of Canada. Retrieved January 9, 2009. Rondot, J. 1994. "Recognition of eroded astroblemes." Earth Science Reviews. 35 (4): 331. OCLC 196389648. Wilson, J. Tuzo. 1968. "Comparison of the Hudson Bay arc with some other features." Science, History and Hudson Bay. 2: 1015–1033. This page was last modified on 23 January 2009, at 21:07.